Hours after an explosion ripped through a train car at a St. Petersburg Metro station, a number of Western mainstream media outlets claimed the suspected terrorist attack might have been a plot to distract Russians away from recent anti-government protests. With little details known in the aftermath of Monday’s explosion between Sennaya Ploshchad and the Tekhnologichesky Institut metro stations, the BBC suggested in its coverage that the explosion might be an attempt to distract from anti-corruption protests facing the Russian government. On March 26, a wave of opposition protests were witnessed across cities in Russia, including an 8,000 strong demonstration in Moscow. Asked about the demonstrations, in which thousands of young people protested against Vladimir Putin’s government, Rainsford said: "Well, there's been political demonstrations against corruption and against Putin and his system, if you like. There has been some kind of very quick commentary on the liberal media that perhaps this is some kind of attempt to distract attention from the calls for a corruption investigation and calls for President Putin himself to step down. So that's been one reaction." While Rainsford did not mention where this quick commentary came from, Oliver Carroll, managing editor of The Moscow Times, then alluded to similar conspiracy theories on a BBC broadcast. "There will be many theories, of course about conspiracy theories,” Carroll said. “We know that the bombings in 1999, which coincided with Putin's rise and his attempts to become president raise a number of concerns and suspicions. So I think that will be another working theory." Diplomatic editor at Sky News, Dominic Waghorn, read out a statement by St. Petersburg Governor Georgy Poltavchenko, before inferring that the explosion would be used to justify restrictions on protest groups. “I think we can draw conclusions already about what this is likely to lead to,” he said. Meanwhile, Putin critic and chairman of the Human Rights Foundation Garry Kasparov‏ claimed on Twitter that the events in St Petersburg were “perfectly timed to serve Putin’s political agenda.” Kasparov then called on people not to confuse sympathy for the victims of the attack with “sympathy for Putin's regime.” He then proceeded to make similar strong-worded claims on CNN. Tragedy in St. Petersburg. Once again "unknown terrorists" perfectly timed to serve Putin's political agenda. Forget protests, back to fear. 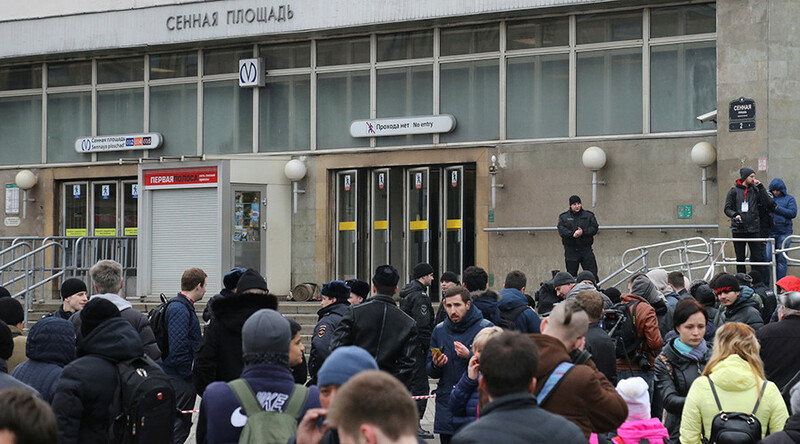 Eleven people were killed and some 45 hospitalized with various injuries when a suspected improvised explosive device went off in a metro train car in central St. Petersburg. Some media outlets have said that a suicide bomber was involved and speculated over the suspect’s identity based on sources and photos. Russia’s Investigative Committee is reportedly considering several scenarios, including a suicide bomber attack, a law enforcement source told RIA Novosti. Putin has chaired a meeting of security experts focused on investigating the explosion. The president earlier said both terrorist and criminal motives were being probed. While refusing to speculate on details of the incident, Kremlin’s spokesman Dmitry Peskov said that signs of a terrorist attack are “plain to see” and referred journalists to police and investigators for further updates.